Any smart entrepreneur will realize the importance of tracking the behavior of their prospects. Guiding and following your prospects through every step of the purchasing process is the only way to create effective marketing campaigns that reach customers in a specific, personalized way and increase sales. This is where marketing automation tools become crucial. How can your business benefit from marketing automation tools? Among the endless advantages of marketing automation, maintaining consistency when building and sustaining relations with customers is certainly the most important benefit. If marketers base their communication with prospects on Facebook or Twitter, they may find it challenging to post and tweet on a regular basis. This may be due to many reasons; numerous work tasks and duties, unplanned meetings, family priorities, etc. Whether you are a proud business owner or a successful marketer, chances are you’re well aware of the importance of creating positive relationships with customers. And just like any other relationship, these require consistency. Marketing automation tools help you achieve consistency in the means of maintaining regular relationships with existing and potential customers. When marketers have a sequence automated posts on a schedule, instead of posting each one manually, they are able to create a sense of constant presence. Visitors then know that your business or brand is actively engaging with customers. This includes providing fresh and relevant information about the products and services that you sell. Other benefits of marketing automation tools include better use of data, more effective data storage and increased overall efficiency in the process of completing tasks. Marketing tools can simplify complex data analyses and help users predict market fluctuations. Effective data storage helps users evaluate their marketing strategy, as well as predict and overcome possible obstacles. Once you acknowledge and understand the benefits of marketing automation, you find it tricky to choose the right automation tools for your business. Whether your business is well developed or just a small and fresh start-up business, these tools can help you tailor your marketing campaigns more effectively. HubSpot is popular for a couple of reasons, but one reason stands out above the rest. This is probably the most user-friendly platform you will find. It is convenient, straightforward and intuitive to use. In fact, this is probably the only platform where you dive straight into advanced marketing tactics without having to read any documentation. When you do eventually need help, HubSpot offers excellent support and documentation. While HubSpot was originally built for smaller businesses, it is now used by larger businesses too. So regardless of the stage your business is in at the moment, you might want to look into this platform to see whether it meets your needs. HubSpot represents the perfect example of a "marketing automation solution" It offers the ability to manage and email your leads. It allows you to create, manage and promote content. It includes basic SEO features and a decent amount of templates. It helps you capture leads and create landing pages as well as do all of your split-testing. This is the same rough feature set that's common to all marketing automation platforms. The differences are slight and primarily in the style of implementation. Some tools have a few extra features that stand out. Others differentiate themselves in how they implement the basic features, and whether it fits your company culture. While we could try and list all of the pros and cons of HubSpot compared to the other platforms, there's really no need. HubSpot offers a free trial where you can fully test whether it meshes with your needs. This is far superior to reading any reviews or opinions on which platform will or won't meet your needs. Unlike HubSpot, Marketo isn't suitable for any business at any stage. It specifically targets medium to enterprise level customers and its pricing points reflect this. If you're a small business owner, feel free to ignore this vendor altogether for now. The one area where Marketo differentiates is in its focus. It was always focused more on B2B types of businesses. This reflects in the depth that same of its features have. This explains why it has some of the best lead-nurturing functionality. But it also explains why it isn't very user friendly. Whereas HubSpot can be picked up by anyone in minutes, Marketo assumes you have a staff of IT people and marketing specialists to handle it. Pardot is another marketing automation tool that you will like if you're on a B2B business model. One of the first things people notice when compared to Marketo, is its ease-of-use. It isn't as simple to use as HubSpot, but it is probably the most intuitive out of the enterprise tools. Being a Salesforce product, you might want to consider it if you're a Salesforce fan. Obviously being a product of the same company, it has excellent integration and syncing with Salesforce. The one thing you sacrifice with Pardot (in comparison to Marketo) is the lack of depth to the features. You get a more pleasing and usable interface, but the features are a lot more shallow. If your marketing automation needs are primarily about nurturing leads through email, ActiveCampaign is the one for you. Nobody beats ActiveCampaign at email marketing automation. The great thing about ActiveCampaign is that it makes complexity easy. It allows you to set up even the most complex marketing strategy an experienced marketer can come up with. Yet it makes even such a complex setup seem like playing a simulation game - it is very intuitive to do. In the rare chance that you get lost, it provides some excellent learning resources for newbies. Due to this, ActiveCampaign can be practical for businesses of all sizes. What do Hubspot, Marketo, Pardot and ActiveCampaign have in common? In the sea of marketing automation tools, Hubspot, Marketo, Pardot and ActiveCampaign are recognized as reliable products that most every business should consider using. Despite their differences, these four tools have a lot in common. They help marketers focus on their prospects and accelerate them through the sales funnel via an act-on solution. 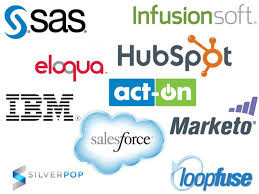 Hubspot, Marketo, Pardot and ActiveCampaign are all well integrated with other popular solutions. These are tools that are dynamic and offer numerous features, all to the benefit of your marketing strategy. They will all help you with implementing a quality inbound strategy. These marketing automation tools help marketers attract more visitors to a website, convert them to leads and even paying customers. Within the past few years, marketing has changed significantly. Instead of pushing products or services onto potential customers, marketing is now based on intriguing people and earning their interest. While the “old” marketing relied on one-way communication through slogans and short messages, modern marketing communication is all about two-way, interactive communication. If you are looking for an effective way to reach out to prospects and convert leads to customers, you should consider a modern marketing approach. Regardless of the size of your business, using some of the marketing automation tools mentioned above will help you achieve positive results. In addition, these marketing automation tools can decrease your costs. With a good automated solution, it takes only one employee to set up lead nurturing and complex marketing campaigns, rather than a dozen experienced marketing professionals. After your marketing campaign has been set, your business will automatically send out numerous personalized emails to prospects, based on their specific interests. Whether you choose Hubspot, Marketo, Pardot or ActiveCampaign, you'll be able to track the way your prospects interact with your business. Each of these marketing tools can provide you with detailed information on website visits and clicks, content downloads, and much more. This will help you understand their decision-making process and create better relationships through interactive communication, and appropriate, well-timed reactions.